I had a lot of new experiences as a result of being a Mazars Brand Ambassador, which is something that only a few people get to do. Being a Mazars Brand Ambassador helped me develop some of my hidden talents. Learning by doing is one the best things about being a Mazars Brand Ambassador. In addition, you get a chance to do things that you might never have thought of doing before. As a result of my experience being a Mazars Student Brand Ambassador for 1 year, I am grateful for all of the wonderful experiences I have had as a result of each Mazarian. It has been a special part of my life. Thank you. While I was a Student Brand Ambassador, I was able to improve my English, my public-speaking skills, and my writing skills. 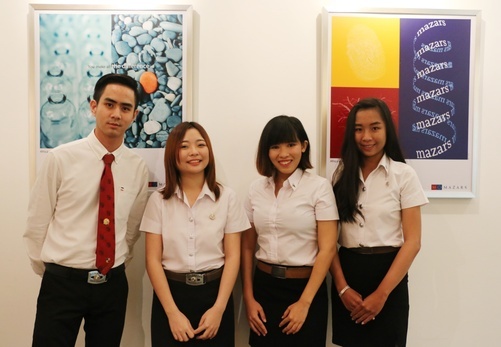 I had a wonderful experience, and made some great friendships at Mazars Thailand. In addition, I had the opportunity to do an apprenticeship at Mazars. I'd like to thank Mazars Thailand for the warm welcome. I will never forget having had this great opportunity. This programme is a great way to receive training on how to confront challenges in my future career. Without a doubt, this programme was a tremendous opportunity for me to gain some valuable experience.